Following the surprise cancellations of Netflix's Iron Fist and Luke Cage shows, the streaming service has struck again by axing the Marvel series that started it all, Daredevil, as reported by Deadline. Exploding out the gate with a popular and well-received first series, interest in the show began to dwindle following a two year hiatus and the disappointing team-up event, The Defenders. While the third season, which landed on Netflix last month, has been met with much more acclaim, it was seemingly not enough to save the Devil of Hell's Kitchen from the service's chopping block. It's unknown whether Marvel's move towards the upcoming Disney+ streaming service has anything to do with the decision, though the studio has already announced new shows starring Loki, Falcon and the Winter Soldier for the Netflix competitor. “Marvel’s Daredevil will not return for a fourth season on Netflix," said the company in an official statement on the matter. "We are tremendously proud of the show’s last and final season and although it’s painful for the fans, we feel it best to close this chapter on a high note." 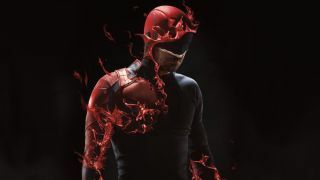 The statement continued, "We’re thankful to showrunner Erik Oleson, the show’s writers, stellar crew and incredible cast including Charlie Cox as Daredevil himself, and we’re grateful to the fans who have supported the show over the years." Currently, Marvel's Jessica Jones and The Punisher shows still remain, with each set to return for another season. Whether they continue beyond that is another story.